So, after the Snowpocalypse, we had Valentine's day! Last year I made Valentine's buckets for Rori and Liam's Sunday School teachers and for our small group friends. They were a lot of work, so I said I wasn't going to do them again. But then my friend April mentioned them. And I thought to myself, "eh, it wasn't that much work and I would really like to do it for Rori's teachers at school. So, I decided to do them again. 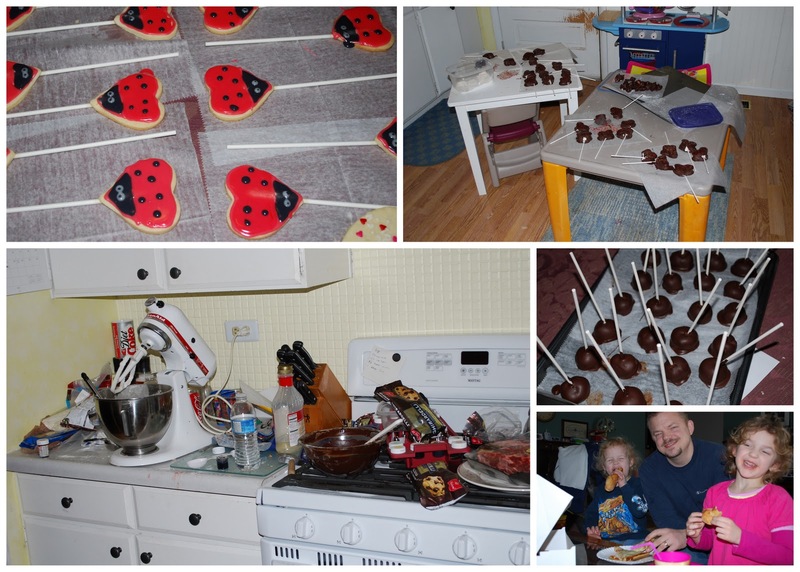 This year, I saw ladybug cookies on my favorite food site and Rori was really excited about them. I didn't think they looked hard or even that time consuming, and Bill was going to watch all three kids so I figured it would go fast without any "helpers". I am a terrible judge of what is time consuming. I set up an assembly line for the cookies. They were adorable. While I waited for each part to dry, I worked on the rest of the treats for the buckets. I rolled the truffles, cut out the marshmallows, and dipped all of them in chocolate. The entire process took from about 11:30 am until 9:00 pm. I am an idiot. My back killed me from bending over, frosting the cookies, my kitchen was trashed, and I was exhausted. Poor Bill was tired too--I had banished him and the kids to the living room to eat their lunch and dinner. Of course I didn't get pictures of the final bucket because, well, I was stumbling to my bed that night. I won't be doing them again next year, except I probably will. My sweet Rori Rose gave me a picture frame and half of her sugar donut for all my hard work. She also made a point of telling people that I worked on them from lunch to bedtime--I didn't even have to tell her to do that. I love that girl! Where's Noah's and Juliana's bucket? They turned out GREAT! Good job! Rori is such a sweetie. Since not doing them again next year doesn't seem to be an option (based on the reviews)...maybe you could start Feb. 1 and freeze cookies & truffles.